figure 2.1. Differences in gray matter volume between abuse and control subjects. Significantly lower gray matter densities in abuse subjects were observed in the left visual cortex. Crosshairs placed at x = -14, y = -90, z = -1 (left lingual gyrus). Color scale (0-5) represents t values. these regions for the abuse subjects. Within these areas, a strong correlation existed between visual memory and GMV of BA 17 (r = 0.68, p < 0.00001; x = 10, y = -91, z = -5; Fig. 2.2; Tables 2.1-2.3) (also see color insert). The MAS subscale with the strongest correlation to BA 17 GMV was visual recognition (r = 0.65, p < 0.00005; Talairach's coordinates x = 9, y = -90, z = -4). A significant correlation was also seen between GMV of BA 17 and an overall index of short-term memory (r = 0.46, p < .005; Talairach's coordinates x = 19, y = -101, z = -8). Within the occipital region, verbal memory correlated with GMV of BA 19 (r = 0.43, p < 0.01; Talairach's coordinates x = 45, y = -75, z = 0). figure 2.2. 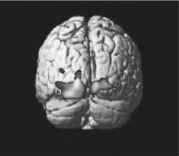 Correlations between brain volume and visual memory in the left primary visual cortex ( LV-1). 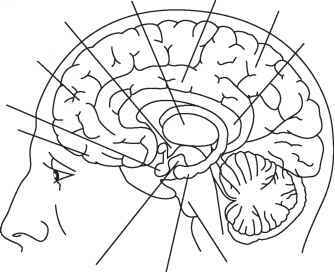 Crosshairs placed at x = -3, y = -90, z = -3 (left lingual gyrus). The color scale (0-6) indicates t values. proposition that disparate forms of CA can differentially influence the sensorium and its associated neurobiology. Thus, one prediction is that if the abuse that was experienced involved substantial visual perception, then perhaps those brain systems subserving visual information and processing were maladaptively impacted. Given that the neural substrates of visual perception overlap those of visual memory (e.g., occipital, inferior temporal, and parietal cortices; Slotnick, 2004), the possibility that visual stimuli perceived as external stressors (e.g., a child literally seeing an abuser perpetrating the abusive act[s]) could have adverse effects on the developing visual system seems plausible.